Here’s the story of the prodigal son from the Bible. It’s quite moving. The Bible is jammed with emotional insight. So this post is a twofer. 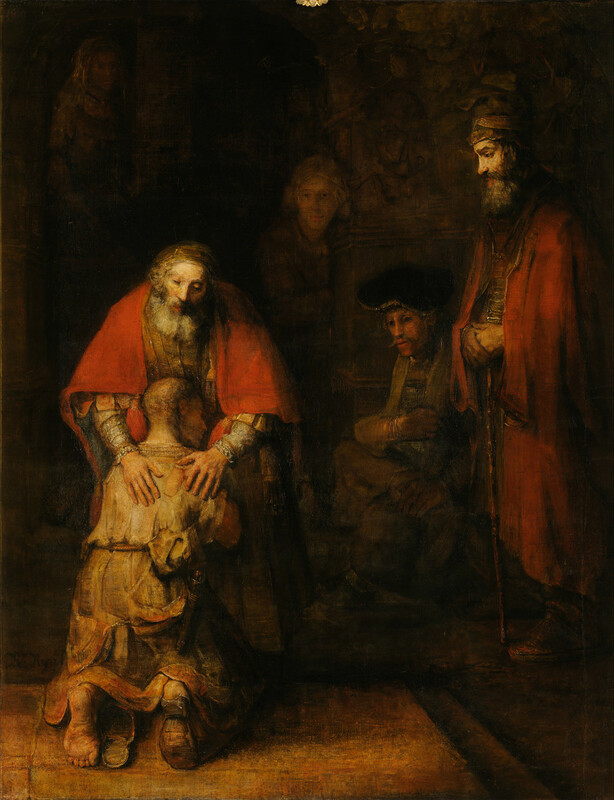 We’re going to talk about the biblical story of the prodigal son, and then about the Rembrandt painting. Hey, now we’re into Shakespeare. So it’s a three-fer. I think something’s telling me I’m in the mood to write more posts guiding people to see the emotional insights in works of art. So now this is like the movie Inception. I have to come out of Hamlet, then out of the Bible, and then look at Rembrandt. Let’s do it. I still remember reading those lines from Hamlet for the first time, in my apartment when I was in college. It blew me away. You must give up whatever you got from your misbehavior if you want to repent it and forgive yourself for it. That’s just a small part of what it meant to me. Now look at the story in the Bible. In order to repent, to forgive himself, to be worthy of forgiveness, the son gives up the one thing he has left – the right to call himself his father’s son. He goes to his father to beg to be a laborer in his father’s fields, to be no more than a servant to his own father. This enormous sacrifice shows us that he is worthy of our compassion. It’s moving, isn’t it? Do you feel it? Now look at the young man’s bare left foot in the painting. Look at the way his head is turned as he hugs his father. Do you feel his humility? His supplication, his grief, his gratitude? You feel it or you don’t. But I’m pointing you right at it. I’d be very interested in your thoughts!